This past weekend I finally made it to the Mill City Farmers Market in downtown Minneapolis. If you have a chance to stop by one Saturday morning before they close in October, I highly recommend it. Not only do they have great fresh fruits and vegetables from local farmers, but you can get ground buffalo, fresh baked bread, honey, beautiful flowers, woven goods, hear live music, and even see a cooking demonstration. Next to the honey tasting (I’ll get to that in a minute), the cooking demo was my favorite part of the morning. We got to see local chef Nick Schneider prepare salads that would be perfect for a picnic or a potluck dinner. The two he made were a classic German potato salad and a beet, chevre, raspberry and pecan salad (both recipes will be on the Mill City Farmers Market website until Friday – click here – or you can contact the chef at the email address listed on the site). The German potato salad recipe was interesting because he didn’t use any mayonnaise, but instead created a vinaigrette out of sautéed bacon and onion mixed with red wine vinegar and Dijon mustard. Instead of being a thick, heavy salad, it looked light and refreshing and the color of the red potatoes mixed with the bright green of the parsley and chives in the bowl was quite beautiful. More intriguing, however, was the beet salad. Before Saturday, I had never in my life tasted a beet. I had no idea how to prepare them, what texture they had once you bit into them or even what their taste could be compared to. But after watching the chef prepare this stunning salad, my friend Hilary and I decided to take on the challenge or making it for the BBQ we were having at my house later that evening. Not only were we curious as to what a beet tasted like, but we were mesmerized by the magnificent color of this salad. We had never eaten something such a beautiful shade of fuchsia before in our lives. We had to try it. So after the demonstration, we collected all the ingredients from the vendors at the farmers market. On our way out, we had to stop for fresh baked bread and the most beautiful bouquets of flowers (that were only $6!). And then we hit the Ames Farm honey stand. I knew I wanted to get a jar of local honey, but I never expected the decision of which one to choose would be so hard. I learned that there is more than one flavor of honey. In fact, they had about ten different flavors to choose from. Each flavor came from a single source (a different type of flower) and had a very distinct flavor. A couple of the flavors we sampled were basswood and dandelion. It was amazing how different they were. The basswood was soft and light and carried a hint of a mint flavor. The dandelion was much darker and had a heavier taste. It was a more intense honey and much sweeter than the basswood. After going back and forth, I decided on the basswood. Next time, however, I think I’m going to get the variety pack, which includes several small jars of the different flavors so you can try them all. That night, Hilary and I got together with two other friends for a BBQ/collaborative dinner. We had quite the extensive menu and after catching up for quite awhile, it was time to get down to business. The main portion of the dinner was grilled salmon which was prepared with a fish rub. Although the rub stained the fish red with spices that made me think of BBQ or Creole, it had a much tamer taste and the spices worked really well with the natural flavor of the fish instead of overpowering it. Side dishes included a salad of green leaf lettuce, mint leaves, cucumber and feta cheese. I would never have though to put cut up mint leaves in a salad, but it was a great addition and just enough to add a different mix of flavors without being too strong. It was an interesting contrast to the sharp bite of the feta and the soft leaves added a nice mix of texture next to the crisp lettuce. We also had popovers (the recipe from The Found Recipe Box) and grilled zucchini. And for an additional side, Hilary and I put together the beet salad we had seen at the Mill City Farmers Market. After the beets are steamed and cut up, it really doesn’t take much time at all to assemble the salad. Seeing as how neither of us had ever tried a beet, we were a little hesitant to pop these shocking pink clumps into our mouths. But I was pleasantly surprised at how good the salad was. This salad runs the full gamut of flavors, from the rich, earthy flavor of the beats to the bitter citrus bite of lemon, then back to the sharp taste of the chevre and finishes up with the lovely sweet kiss of raspberries. Best of all, are the bites when you’re lucky enough to include a toasted pecan on your fork. We used some of my grandfather’s pecans for this salad, so it was an extra special side dish to our dinner. Unfortunately, I was so excited to see my friends who I haven’t seen in a long time and we were so busy talking and cooking that I completely forgot to take pictures of all the wonderful food! I apologize, especially for the beet salad because it was absolutely exquisite. But hopefully you’ll be intrigued by the description and you’ll make the salad for yourself (if you can’t find the recipe on the Mill City Farmers Market site, let me know and I’ll send it over to you). 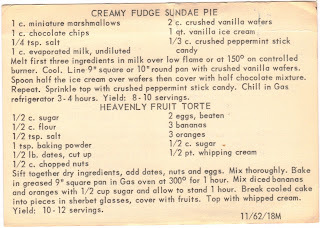 To top off the evening, we had a dessert, of course, from The Found Recipe Box. As a treat to combat the hot weather, I made a frozen dessert: Creamy Fudge Sundae Pie. It’s really quite simple to make and if you like ice cream cake (especially the one from Dairy Queen), then I think you’ll love this dessert. I put the vanilla wafers in the food processor, but I’m not sure that’s necessary. The recipe instructs to just fill the bottom of the pan with the crumbs, but there’s really nothing to hold them together so when you scoop out a piece of the sundae, you’ll need a spoon to make sure you can gather up all the crushed wafers to go with each piece. The chocolate layer in this sundae pie is absolutely incredible. It’s a rich, mouth-watering chocolate flavor so if you don’t like a heavy chocolate taste, you might not enjoy it. But for those of you who are like me and can never OD on chocolate, this is quite a treat. My favorite part was the crushed peppermint candies on top. They are the perfect addition and truly complete this dessert. 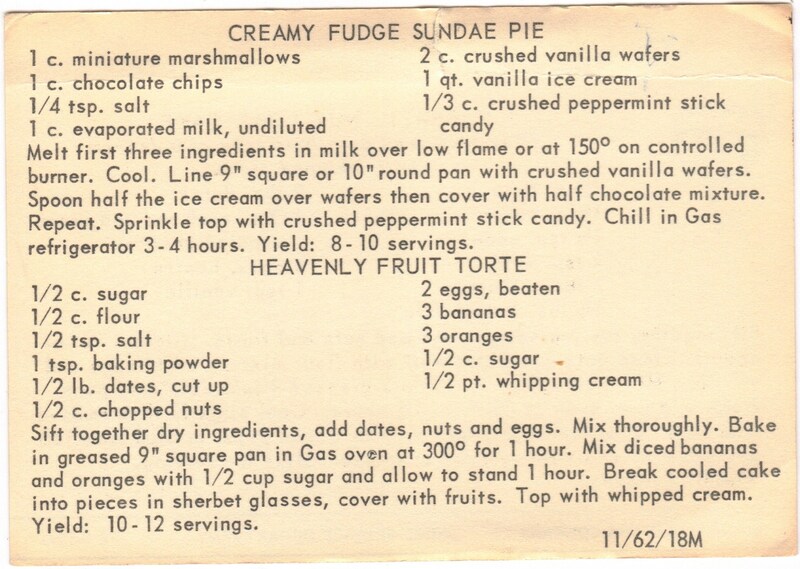 There is also a Heavenly Fruit Torte recipe listed on the bottom of this card, but I didn’t make this one. My friend Christine also brought a homemade plum pie (yum!) so we had more than enough sweets. But if you make this recipe, please let me know and be sure to send a picture of your creation! I’d love to hear how it turns out. Oh my goodness Molly! That sounds luscious! YUMMY. What could possibly be better than HOMEMADE ICE CREAM CAKE???? Stay cool!